The Citizen Science Global Partnership is a network-of-networks that seeks to promote and advance citizen science for a sustainable world. Launched in December 2017 at the UN Science-Policy-Business Forum on the Environment, the Global Partnership brings together existing networks of citizen science researchers and practitioners with advisory boards representing policy, business, and community-based perspectives. Offer a coordinated point of entry for government, NGO, and business partners seeking to collaborate with the global citizen science community. Network, support and seed 7+ networks that support and advance citizen science, including existing citizen science associations in the US, Europe, and Australia and emerging networks in Africa and Asia. Network, support, and seed 3+ consortia of citizen science projects that conduct research on similar topics, such as vector-borne disease or pollution, in different areas of the world. The consortia model allows projects to mobilize local communities while sharing good practices and data globally. Support the collection of exchange of open and findable, accessible, interoperable, and reusable (FAIR) data by formalizing a citizen science data standard and building an open data portal. Understand and track the contributions of citizen science to supporting sustainable development, including through an index that connects citizen science to the sustainable development goals (SDGs). Expressions of interest from citizen science networks that are interested in co-designing and eventually working with the Citizen Science Global Partnership. Support from individuals who can help lead or implement projects to help the organization grow. A full call for participation can be found on this page. 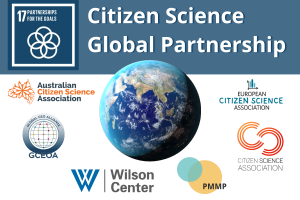 The Citizen Science Global Partnership welcome submissions until 20 April, 2018.